I got back into my routine of early morning rising and exercise, and as I began writing this, I was listening to the waves crashing at the shore, which is just steps away from our condo. RaGhoul took advantage of the swell last night and had an epic sunset surf session! I would have joined, but there is a lack of surfboards here on this island because there are not often many surf-able waves (unless the island receives a bump from a hurricane). Finishing up, we knew we had to leave promptly at 3pm to catch our birthday surprise - horseback riding! - that Nick had lined up for Katie with Preacher Steve, a local of St. Croix who had moved to the island after giving up his profession as a Roman Catholic Priest in Ireland. Preacher Steve is an absolutely amazing human we came to find out, and he took the time along the ride to stop at cultural and historical landmarks so we could learn a little more about the islands. He also showed us tarantulas (awesome) and let us ride the horses fully into the ocean. That night we dined at Savant, which is definitely one of the better restaurants we’ve visited here, and all fully enjoyed it. Someone else happened to be celebrating their birthday at the same time, which made it even more of a fun celebration! On Wednesday, 10/3, we had a big milestone day: the preliminary Coast Guard inspection on Trilogy IV. All seemed to go well and the Inspectors, Faye and Jonathan, said they would return that upcoming Tuesday, 10/9, which would allow them the time to complete the appropriate paperwork and follow-up with anything else that may need to be addressed. To the left, Katie & Raquel tested the fire systems aboard T4! Since we had to wait a few days for the paperwork to be completed, we decided to have a little fun of our own! On Thursday, 10/4, we explored some gorgeous tide pools in the morning, a recommendation by Nick. It was about a 3-mile hike in to the pools, and it was totally worth it! The tide pools were absolutely phenomenal with large swells occasionally crashing over the ocean walls that enclosed them. After the very hot hike, we enjoyed the much cooler water swirling inside the shallow pools, and soaked for quite some time. After our tide pool adventure, the (Trilogy) masses decided it would be fun to stop by Mount Pellier Domino Club to see the famous beer drinking pigs that we’d read about on our travels over. However, due to an unfortunate accident (we didn’t ask details), we were told the pigs now only consume O’douls (lol), but they were all out of stock when we arrived. As a result, we made a quick pivot to find another spot for lunch, and conveniently we discovered that sitting right at Cane Bay is a beach bar! Perfect. We ordered some delicious food and enjoyed a nice relaxing lunch spot, with views that couldn’t be beat. Since we knew we’d be leaving soon for our voyage, we just couldn’t help but try to fit in all the adventures we could while in St. Croix! So next up on the day’s agenda was an exciting shore dive, just steps away from the beach bar - 200 feet, to be exact. We went into the Dive Shop across the street, geared ourselves up, and off we went for more adventure. And let me just say, this was truly the best dive I have ever been on, hands down. The most diverse and elaborate soft coral growths, massive marine sponges, creatures and critters, as well as a shark who flipped over and rubbed its back into the sand playfully -now, that was a new sight for all of us! It literally felt like we were dream diving in an aquarium, except it was the open ocean and it was real life! After our sight-seeing and fun-filled day Thursday, on Friday it was time for full-on ocean voyage prep mode. We spent the day prepping, cooking, portioning, and freezing meals for the crossing at Big Whip’s condo. On an open ocean crossing, a quick reheat of a frozen meal is great for a rough day at sea; no prep, no fuss, just pull out a pre-made meal and heat. We found a 20 quart dutch oven to cook the large amounts of vegetarian chili and Thai green curry beef stew on the stovetop. RaGhoul also made her family’s secret enchilada recipe. It was a team effort, for sure. Kai, Nick and Katie had to leave to help finish lifelines and other tasks on T4 but Raquel and I continued in the kitchen. After a long day, we all gathered at the end of the evening to share an extra tray of the enchiladas that we had cooked. On Saturday, Jim and Jeff had decided that it would be good idea to take T4 on a “shakedown” a nautical term meaning essentially to test the working performance of a boat. 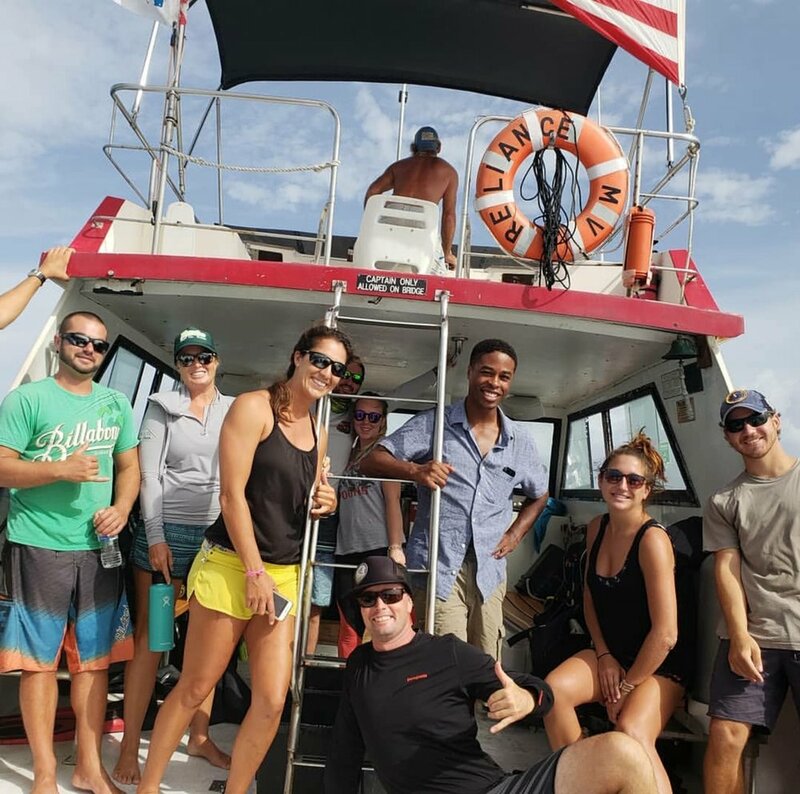 We would motor to St. John Saturday, moor or anchor overnight at Maho Bay, circumnavigate St. John, and return Sunday afternoon to Saint Croix, so as not to impede any work on the catamaran scheduled for Monday morning. I’m happy to say that the trip went extremely smoothly, with only one small hiccup along the way when an alarm went off for water in the starboard diesel. In what ended up being very educational for all of us, Jim quickly shut off the starboard engine and opened the engine hatch to clear the water. We were all able to watch and learn how to properly clear water from the diesel fuel, should we ever be faced with a similar situation onboard any vessel. We maintained a solid 20 knots speed while motoring to Maho Bay from Christiansted, which took between 1.5 - 2 hours. The sea conditions were perfect, with smooth, calm waters and mostly overcast skies. A brown booby bird followed us for quite some time, often flying low over the ocean or behind the boat as it rode in the draft of air created by the boat. Booby's also feed by plunging into the water for a single fish, and we saw our little friend diving repeatedly for snacks along the way, all while drafting aside and behind T4. Upon arrival to Maho Bay, we picked up an overnight mooring and settled in for a comfortable night. We had a wonderful family dinner where everyone participated in preparing steak and veggies and we ate at one of the large family-style tables on T4’s spacious stern. It was a sincerely special moment for all of us, and even Kai became misty-eyed saying how truly thrilled he was that we were all together. After dinner we tested all the boat’s crazy custom lighting and Katie helped me set up my fancy hammock between the mast and the jib sail, complete with rain fly and mosquito net, which I spent most of the night and next morning in. The next morning we all took turns “skurfing” behind the boat, though admittedly some had more success than others. Skurfing is a towsport that essentially combines water skiing with surfing. The board is a bit shorter and wider than a typical surfboard, though, and has three larger fins that make the board easier to maneuver while being pulled behind a boat. It was a total blast! We then circumnavigated St. John, stopping at Coral Bay to leisurely float around while we enjoyed sandwiches for lunch. The landscape and geography of the island was impressive, and we were so happy to have had an opportunity to enjoy this amazing day! As the afternoon continued on, we headed back to St. Croix, all of us stoked with the success of the shakedown adventure and the minimal issues we encountered. Officially setting sail from St. Croix, we received our first text from the crew’s satellite phone on Wednesday 10/10! Making great time already, they should be in Panama by Saturday, fingers crossed. HOORAY!